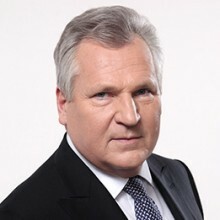 Aleksander Kwaśniewski is the former President of the Republic of Poland (1995 – 2005). He was born on the 15th November 1954, in Białogard, Poland. On March 7, 2006, Kwaśniewski was appointed Distinguished Scholar in the Practice of Global Leadership at Georgetown University, where, as a visiting faculty member, he taught students in the Edmund A. Walsh School of Foreign Service about contemporary European politics, the trans-Atlantic relationship and democratization in Central and Eastern Europe. He is also i.a. member of the Board of Trustees of the International Crisis Group, member of the Atlantic Council of the United States, member of the Bilderberg Group, Head of the Supervisory Board of the Amicus Europae Foundation in Warsaw and International Center for Political Studies in Kiev, Head of the International Council on Tolerance and Reconciliation, Head of the Board of Yalta European Strategy. Until November 2013, President Kwaśniewski co-lead the European Parliament monitoring mission in Ukraine to monitor the criminal cases against Yulia Tymoshenko, Yuriy Lutsenko and Valeriy Ivaschenko.